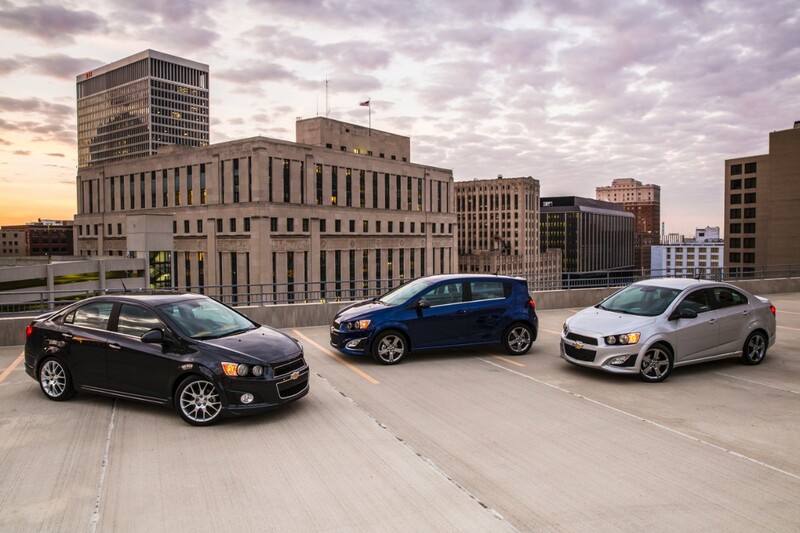 Elizabeth City, NC – The Chevrolet Sonic, available at Performance Chevrolet, the only subcompact car made in America, is again one of the 10 Best Back-to-School Cars of 2014 chosen by Kelley Blue Book’s KBB.com. 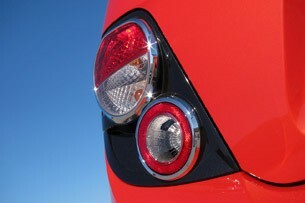 For the third year in a row, the Sonic was recognized by the editors at KBB.com for its practicality, affordability, style, features and personality. 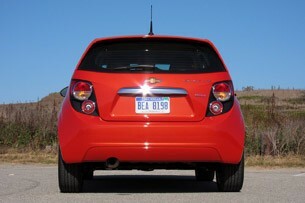 The Sonic is the only car on the list built in America and is the only domestic model included. It is assembled at General Motors’ Orion Assembly plant in Orion Township, Mich.
Kelley Blue Book’s KBB.com touted the Sonic in the past for its stylish appearance and exciting performance, while still focusing on safety with 10 airbags and fuel efficiency with 40 mpg highway. 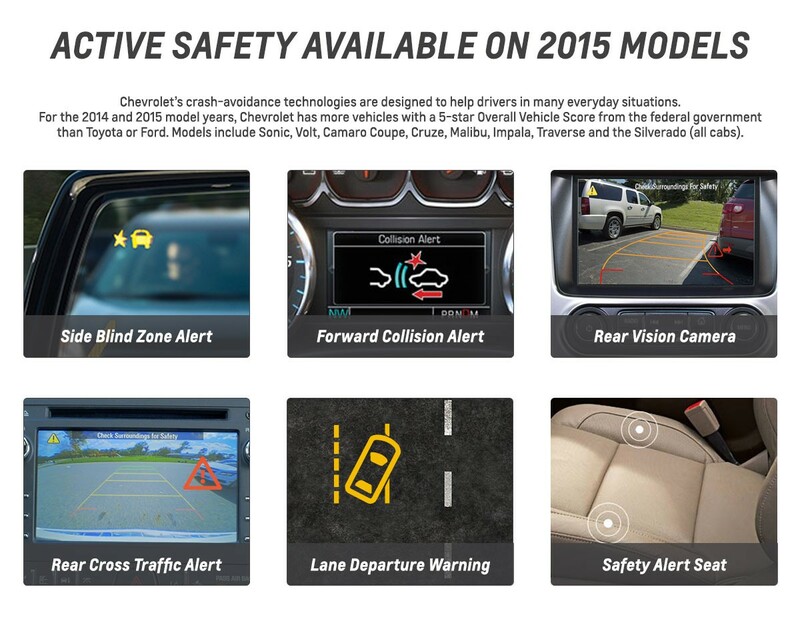 An advanced safety package including forward collision alert and lane departure warning – crash-avoidance technologies typically found on more expensive vehicles – is also available on all but base Sonic models, as well as a rear vision camera. 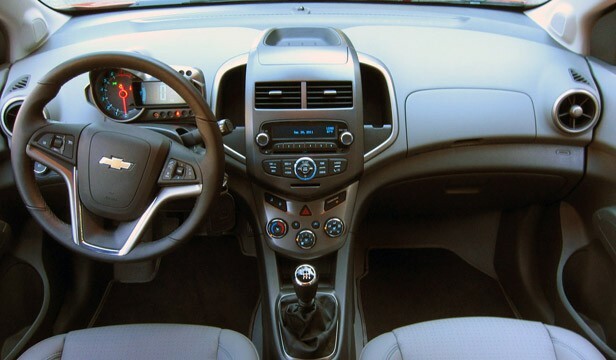 For the 2015 model year, the Sonic will add standard OnStar with 4G LTE and a built-in Wi-Fi hotspot, which provides a mobile hub for drivers and passengers to stay connected. 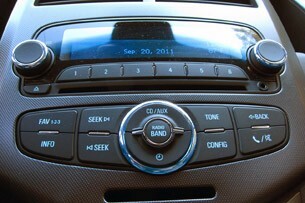 The hotspot is on whenever the car is on and comes with a three-month/three-gigabyte data trial. With the Sonic’s Siri Eyes Free integration, students with a compatible iPhone running iOS6 or iOS7 can direct Siri to perform a number of tasks through the available MyLink infotainment system while they safely keep their eyes on the road and their hands on the wheel. Drivers also can use their smartphone to drive navigation through the MyLink system with the available BringGo navigation app, and listen to their favorite radio station nationwide through the available TuneIn application. 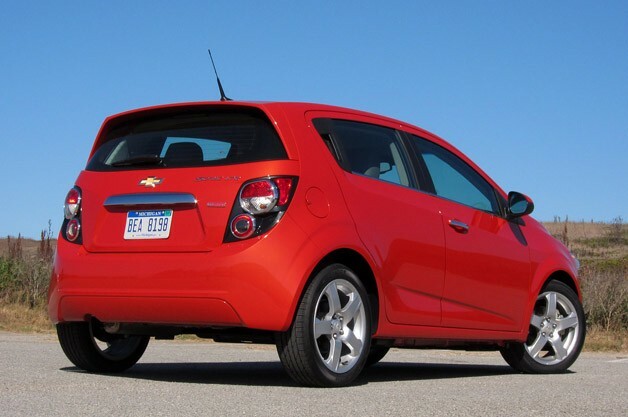 Stop by our Rocky Mount Area Chevrolet Dealership to check out the Chevrolet Spark or Sonic! Perry Auto Group has two dealership locations at 1005 W. Ehringhaus St, Elizabeth City, NC, 27909 or 1001 Halstead Blvd Elizabeth City, NC 27909. 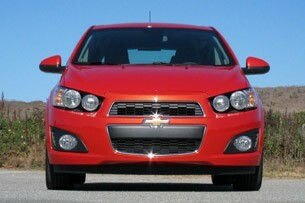 We’ve met the 2012 Chevy Sonic before. Now that the Sonic is starting to roll into dealers, it’s time to find out if Chevy can deliver what neuvo compact buyers are after: high MPGs, a modicum of utility and a cabin that’s more inviting than a GitMo cell. But naturally, we want more. Nearly everything new in the B-segment excels at each of those marks and some even provide an entertaining steer in the process. 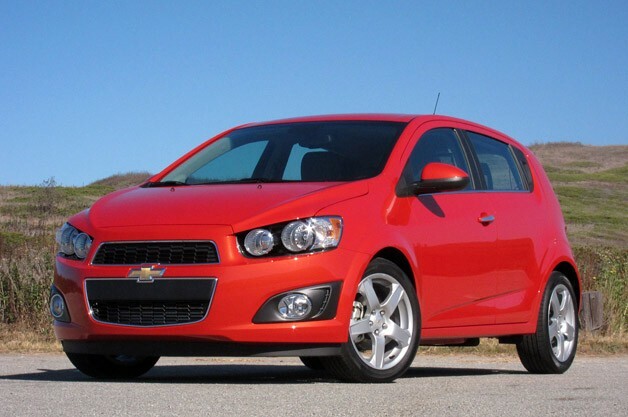 And even though Chevy’s marketeers are hoping to offload the Sonic on teens and twenty-somethings – offering the connectivity they crave with the safety and price point their parents demand – the Sonic has to appeal to a broader swath of buyers looking for a budget runabout. 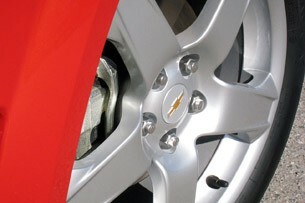 And for the first time ever, Chevy has succeeded. We’re just as shocked as you. On the subject of styling, “Much of the compact’s personality comes from its angular visage and massive, scowling quad headlamps, which give the impression that the Sonic is either deep in furious thought or on the verge of eating your cat. It’s kind of like a less cuddly version of ALF.” That sums it up well. 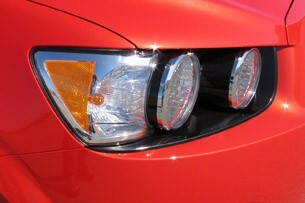 The fascia hangs a little low, like someone put an overpowered space heater in front of a Malibu, but the integration of the bow tie and the quartet of exposed headlamps are both attractive and aggressive, although cleaning bug guts out of the lights stands to be a chore. Overall, it’s a fresh exterior from a youthful band of Korean designers, and even the sedan variant – something that rarely makes an attractive transition in this segment – looks clean and tailored, with an arching, long piece of rear glass that does wonders for lighting the interior. Ah, the interior. Are you ready for this? It’s nice. Not just inhabitable, but a truly enjoyable place to spend time. The plastics, while hardly lux-grade, aren’t pulled from a Playschool big wheeler, either. The designers spent considerable time and effort trying a variety of grains and materials, and the fruits of their labors are used to excellent effect. In particular, the dash and center stack look (if not feel) a grade above what’s commonplace in the competition, and with copious cubbies abound, you’re never wanting for a place to stash an oversized water bottle (massive door pockets), parking tickets (two slots flanking the stereo) or an iPod/smartphone (an alternate glove box mounted high on the dash complete with an indentation to run the cable out the bottom). Housed inside that second box is both a USB and an auxiliary input, an odd redundancy considering there’s already one mounted on the faceplate of the stereo. But we’re not complaining. The standard sound system is a six-speaker setup with AM/FM, CD and MP3 playback, while the optional Connectivity Plus Cruise Pack includes the aforementioned USB and aux inputs, along with Bluetooth streaming, phone connectivity and – as its name suggests – cruise control. We tested the system with both an iPhone and Android device, and selection and playback was simple, if frill-free, through the small LCD panel and accompanying knobs. The controls, including the redundant stereo buttons on the steering wheel, are intuitive and simplistic, as is the traction control and door locks, both controlled by buttons mounted on the transmission tunnel. But the high point of the interior is the gauge cluster, inspired by the now comically common motorcycle display – predictable, considering everyone on the Korean design team rides bikes. Unlike other instrument panels, the LCD display doesn’t wash out in direct sunlight, the tach is the size of a Big Gulp lid and all the pertinent information – speed, MPGs, trip, etc. – are all cleanly laid out and easily viewed. It’s just one in a variety of elements that proves GM is finally sweating the small stuff inside and taking advantage of a design department that’s nothing if not diverse. The Sonic’s lead designer, Katherine Sirvio, is proud to point out that the team working on the interior wasn’t comprised of an uninspired band of industrial designers. Among the crew is a fine arts major, a graphic designer, an interior planner, a lighting guy, one designer from the footwear industry and another that specialized in jewelry design. It shows, particularly with the tasteful – yes, tasteful – use of chrome and the blue backlighting that shines through the stereo controls. Even the leatherette and accent stitching on our LTZ tester (in place of black-on-black or black-on-grey cloth) came across as more upmarket than the material used in higher-priced compacts. On the topic of trim, three models are for the taking – LS ($14,495 sedan/$15,395 hatch), LT ($15,295 sedan/$16.495 hatch) and LTZ ($17,295 sedan/$17,995 hatch) – with the LS and LT coming standard with a 1.8-liter four-cylinder mated to either a six-speed automatic or five-speed manual. 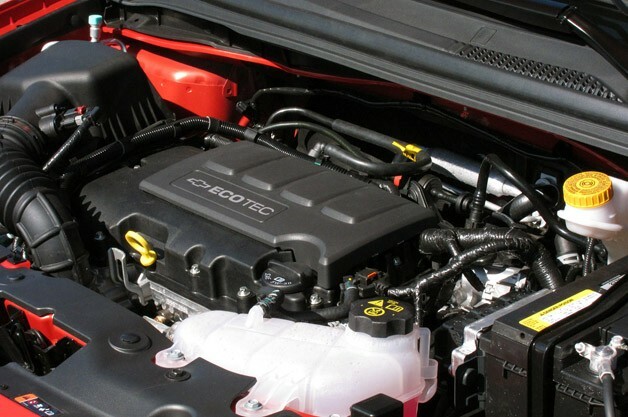 Swilling regular unleaded fuel, the 1.8 returns a respectable – if not segment-busting – 26/35 mpg with the manual or 25/35 with the automatic, and puts out 138 horsepower and 125 pound-feet of torque. 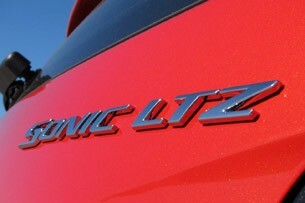 We spent time in what’s sure to be the Sonic’s volume model – an LT sedan equipped with the six-speed auto and 1.8-liter – and found it more than adequate, even with three lanky journalists and their luggage in tow. 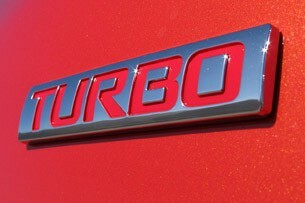 But as you’d expect, we spent the majority of our drive behind the wheel of a kitted out LTZ with the turbocharged 1.4-liter and standard six-speed manual.While the turbo’d four-cylinder puts out the same amount of horsepower as the 1.8 (138 hp at 4,900 rpm), it’s the torque that matters. One-hundred and forty-eight pound-feet comes on at 1,850 rpm and plateaus around 5,000 revs as the engine starts outrunning the turbo. As such, there’s practically no motivation above 5,500 rpm as the DOHC four begins losing its breath. 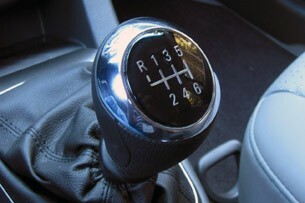 Just shift. That said, it’s good to scoot the 2,684-pound hatch to 60 mph in the low nine-second range and fuel economy hits the magic 40 mpg figure on the highway, with the city cycle coming in at 29 mpg. Commendable considering you don’t have to top up the tank with anything over 87 octane. The 10 standard airbags put it in contention to be one of the safest compacts on the market, as does the Gamma platform that’s made up of 60% high strength steel and set to underpin a range of new Chevys and Opels, including a CUV variant to take on the oft-rumored Ford Fiesta-based crossover. But that ultra-rigid chassis pays its way not just in safety, but in compliance and comfort. For the first time in the U.S., the compact class isn’t entirely comprised of rattling econoboxes with the structural solidity of the Jersey Shore cast. 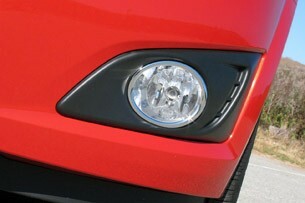 And the Sonic doesn’t just compete, it could be the class leader. Noise, vibration and harshness have been reduced to levels we would’ve enjoyed in the luxury set five years ago, with the combination of the chassis, suspension, tires and interior insulation all working in concert to provide a ride that’s quiet and composed, but never isolating. What’s more: The Sonic is a truly entertaining drive. We were continually amazed at the precision of the steering, along with the surprising lack of body roll. The suspension setup isn’t anything earth-shattering – MacPherson front struts with a torsion beam rear – but combined with the 99.4-inch wheelbase, it’s more than up to the task of handling a set of switchbacks and hunkering down into a corner. Throttle and brake modulation is easily on par with the competition, but while the stick provides short, if rubbery, throws, the clutch pedal is too light and the friction point is utterly devoid of feedback when it finally engages far into its travel. But get the stick anyway. It’s worth the minimal aggravation and shallow learning curve. The braking hardware isn’t anything inspiring either, with 10.8-inch front discs partnered with nine-inch drums out back. How much money is saved with those rear drums? Apparently enough to make a case against discs, but considering how hard we pushed and the minimal amount of fade we experienced, they’ll easily hold up to whatever the average commuter throws at them. So with commendable driving dynamics, a segment-leading interior, an IIHS Top Safety Pick trophy and competitive fuel economy, the only question now is whether buyers can forget the decades of neglectful compacts that GM has foisted on them in a bid to offer something – anything – in the segment. The Sonic is the first chapter in that rewritten recipe book and adds one more compelling proposition that none of the competition can match: It’s built right here in the U.S. of A at GM’s retooled Orion Township, Michigan plant. Just that alone could be enough to sway some consumers, but even if it were made on Mars using alien slave labor, the Sonic is a stand-up value with the stats and swagger to match.